Thermos sent us some new fun lunch items so we would be able to pack healthy and fun lunches for National School Lunch Week. As always we had a lot of fun testing them out and packing lunches! Thermos send us this adorable Hello Kitty FUNtainer Food Jar and Hello Kitty Dual Compartment Lunch kit. Did I mention how adorable the set it? The perfect set for my 4 year old. The FUNtainer Food Jar keeps food hot for 5 hours and cold for up to 7 hours. You can check out my FUNtainer review HERE for ideas on packing oatmeal and Swiss muesli for brunch and my photo tutorial on packing fruit parfaits for school HERE. I love that I can send everything from cut up fruit to yogurt and soup without having to worry that my kids will get it either warm and mushy or cold and unappetizing. They are also easy to open and from my 4 YO to my 10 YO these are our favorite food jars! So what did we pack for lunch? a Hello Kitty Lunch box filled with a CuteZCute Hello Kitty sandwich, a cereal bar, baby carrots and a small container with pumpkin shaped snacks. I love how soft the Hello Kitty Lunch pack is and how roomy! The convenient bottom compartment holds our FUNtainer water bottle with ice pack and the top has plenty of room for a lunchbox and Thermos! 2 thumbs up! My kids are huge Scooby Doo fans so they simply loved this lunch kit for what it was: A Scooby Doo Mystery Machine! And I can't blame them. 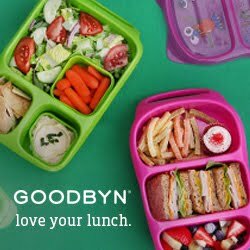 This lunch kit rocks! I love that you open this lunch kit from the back or trunk! My kids loved that detail! The lunch kit is VERY roomy! It fit our Easylunchboxes, plus a Thermos FUNtainer water bottle, an apple and a quick snack for after school! I forgot to take a picture of it filled so I had to settle for an after school picture but you can see how big the lunchbox is! This Star Wars R2D2 lunch kit again is surprisingly roomy and suited for bigger appetites or snack and lunch combined. It was very well received by my Star Wars fans and the padded handle makes this lunch kit easy to carry. Have you guessed it yet? Light and Sound! Any little Star Wars fan would love this lunch kit! So, what did we come up with for lunch? We were able to fit all this with room to spare! Amazing lunches! Love how they coordinated with their new lunch bags!!! Love those thermos bags!